Blue Scientific is the official distributor for Renishaw Raman in the Nordic region (Norway, Sweden, Denmark, Finland, Iceland). For more information or quotes, please get in touch. 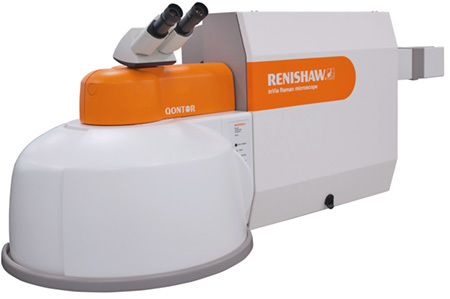 Acquire detailed chemical images and highly specific data from discrete points. Analyse both large volumes and minute traces of materials. Easy-to-use software for data collection, analysis and display. Deposition – Deposit the microparticles on a substrate. Loading – Place the substrate on the microscope stage. Optical imaging – A high resolution image is built from multiple high-magnification images. Where the optical contrast is limited, plastic regions can be determined by laser mapping. Particle determination – The image is analysed automatically to locate the plastic particles. Analysis – The spectra are matched to a database of polymers. You can also customise the database by adding to it, or create your own. In this example, microplastic particles from sea water were deposited on a mirror-polished stainless steel slide. This substrate provides high optical contrast and does not affect the polymer spectrum. While this is a flat substrate, it’s also possible to analyse rough and uneven surfaces with Renishaw’s LiveTrack focus-tracking technology. Below is the high resolution optical microscope image of the substrate (1.8 mm × 1.1 mm). Contamination usually appears as large particles, so these areas were selected for further analysis. It’s also possible to select smaller particles for more in-depth studies. Optical microscope image of microplastics on mirror-polished stainless steel substrate. Particles are located automatically by the software, shown in the image below. Five have been assigned numbers for further investigation. Particles are located automatically by the software for further analysis. fluorescent material (yellow), probably a dye. Two out of the fourteen particles were found to be microplastics (polypropylene and PTFE). The others were identified as inorganic and mineral-based species, including hematite, pyrrhotite, anatase, quartz and silica.